Patra's Other Place: Major addition to our back yard. We have been talking for a few years about having a separate pen for our chooks, and we've had many quotes, both verbal and written, most of them about $1000. 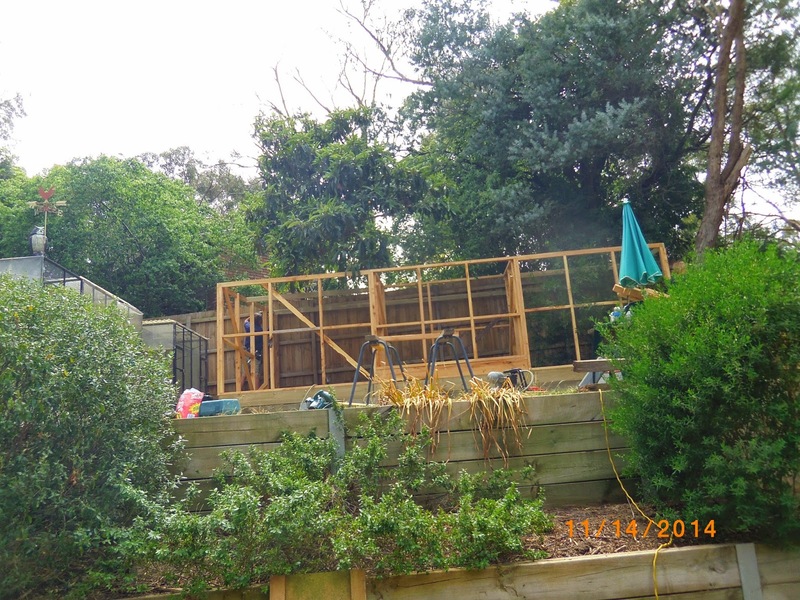 But we ended up choosing a local man who specialises in building custom chooks houses and pens to suit individual backyards. 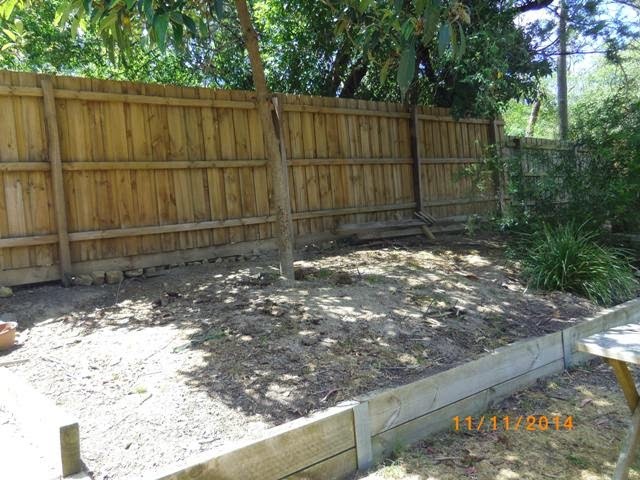 We found him online and after looking at the gallery on his website and seeing what he has done, we decided that he would be the best one to do the job, even if he is $3000 more expensive than anyone else! 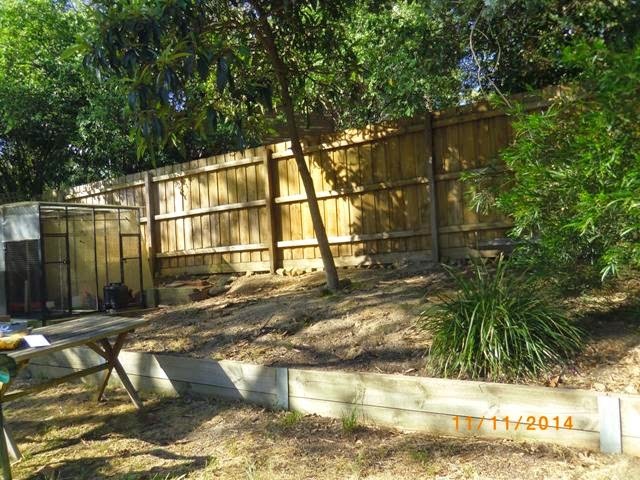 Here is the top end of our back yard. By top end, I mean the very back of it, which is the highest point on our sloping block of land. 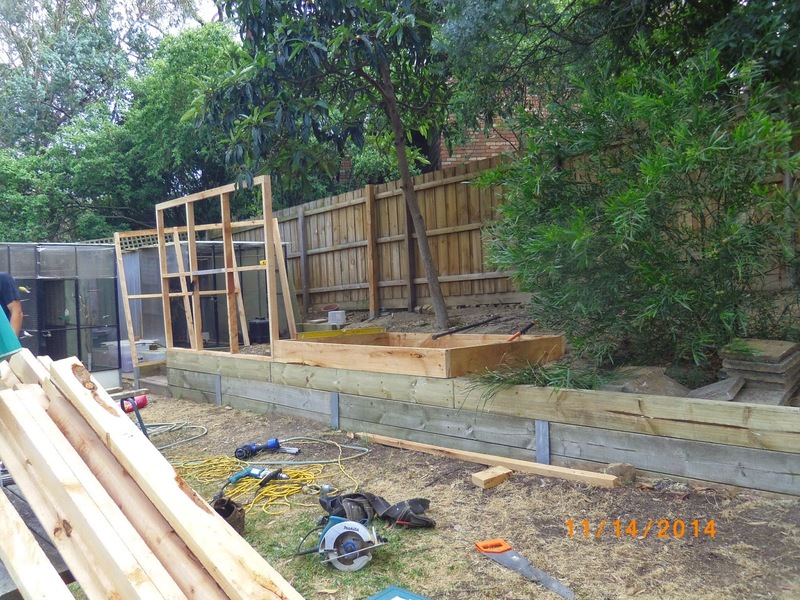 These were taken two days ago before Greg started work on the chook house. 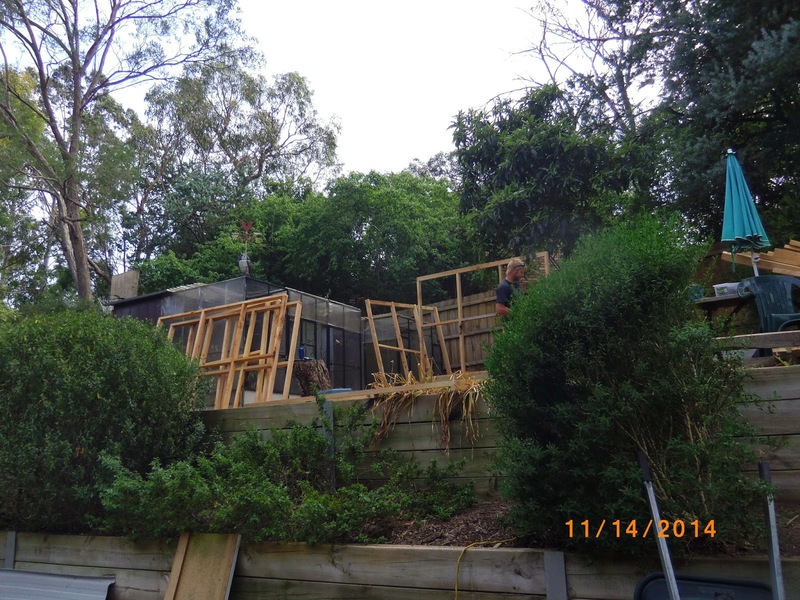 The photo below looking up at the existing aviaries was taken standing behind the house which is on a much lower level as you can see. Nothing, absolutely NOTHING grows in this dust bowl. 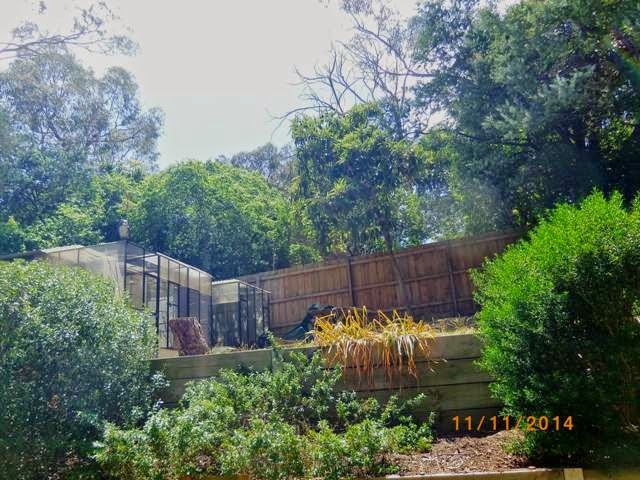 The slim tree trunk in the middle of the picture is a loquat tree that should have grown twice this size in the 40 years that it has been here, but the poor soil has kept it from growing faster. There are a couple of native grass shrubs further along, which survive just about anywhere. Looking at the same patch from the other end, toward the aviaries. Greg and Craig started work on Wednesday, preparing the posts and groundwork for the pen. They constructed the frames at their workshop and brought them here on the back of his truck. Today, they finished erecting the frames, and added the wire over the top of the complete pen. 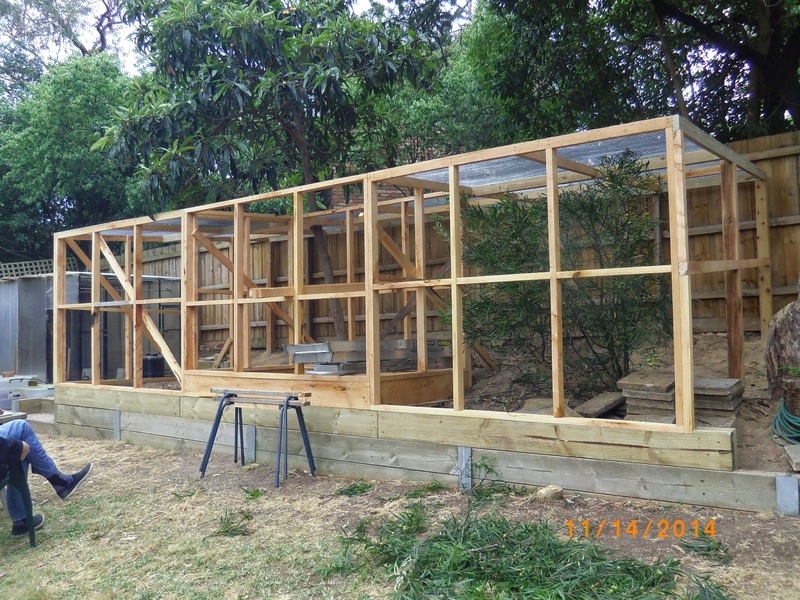 The section in the middle will be the chook house, with a metal roof, and wood panels on all sides except the east which will have wire panels to let in morning daylight. The door will be at the back (north side), and the nest box will be facing the yard, so we can take the eggs without having to go inside the pen. 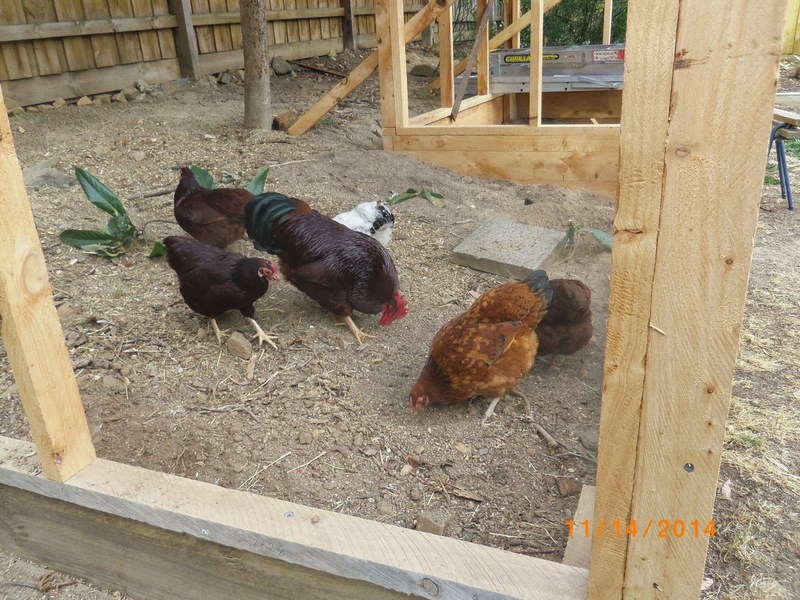 Ralph and his girls inspecting the ground work. "Is this all going to be OUR place? - Wow!" 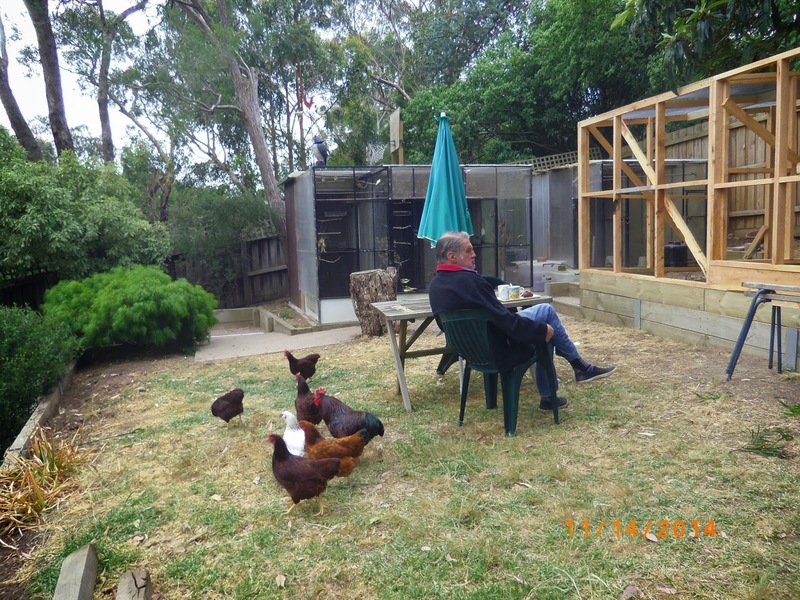 Ken checking the enclosure out with the chooks having lost interest and gone to grassier pastures! These are going to be very expensive eggs!